2Ezshwan is a highly skilled teacher. She has worked in encaustic and cold wax mediums for over 20 years. 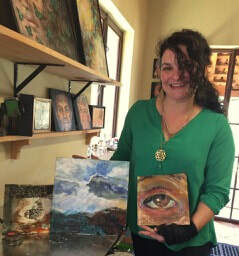 She is classically trained and can move from figurative to abstract easily and can guide you to create your own vision. Study with her for her experience, ability to teach the techniques, and personally guide your creativity. She specializes in working with each student personally to inspire their individuality. The techniques are clearly explained and demonstrated. You will NOT make a painting that looks like another student. Special arrangements for dates can be made if you have 3 or more people interested in a workshop, or would like a private class. THESE GROUP CLASSES ARE INTENDED FOR AT LEAST 3 PEOPLE. If you have 3 or more people interested, I will plan around your schedule. 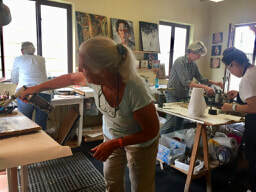 THESE ENCAUSTIC GROUP CLASSES ARE INTENDED FOR AT LEAST 3 PEOPLE. Three Day Intensive: $350 USD plus $60 materials fee. Day 1 & 2 of the encaustic workshop will cover all the basics, including information about how to make paint, about the commercial paints and their applications, about supports, grounds and techniques: paint application, fusing, glazing, inscribing and mixed media approaches, safety, materials, demos of applying paint, glazing, fusing, How to get that smooth surface! Introducing mixed media, creating lines and texture.. 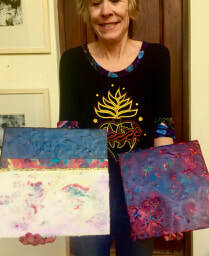 I will emphasize how these techniques can be developed to create a unique encaustic language for each student. I will talk (and demo) how to create glaze layers, as well as some special techniques like inscribing. You will leave with a printout containing all the information you need as well as a list of suppliers. 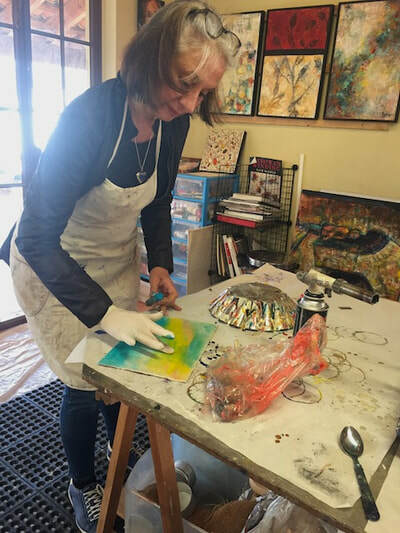 I give participants a thorough introduction to the encaustic medium method. 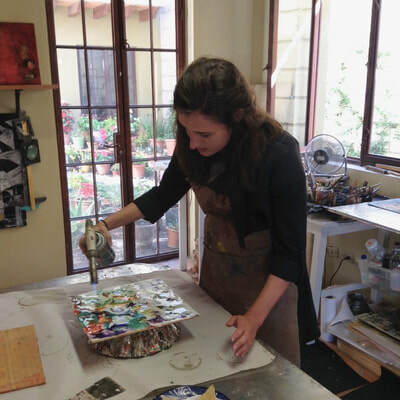 Artists with backgrounds in almost any medium will find these workshops are an exciting opportunity to expand their visual vocabulary with wax. 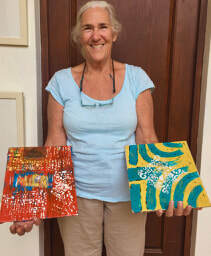 Some who attend have some familiarity with encaustic, others don't, but want to expand their artistic experience. This mix of artists adds to the learning experience and often inspires all to try new techniques. In the advanced classes, we focus on surfacing, embedding, transparencies, glazing and hot pen, image transfers, India ink mark making and more. We will explore combining oil and encaustic and dipping. You should have several finished paintings after the workshops. I will supply all the materials, encaustic paint. 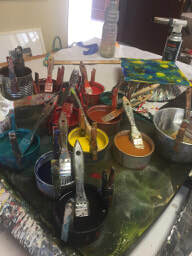 brushes, support panels, electric tools, scrapers and propane torches, as well as showing how you can make your own paints and set up your own encaustic studio. If you want to bring some things to collage you can. Old drawings or prints or photographs can combine with encaustic, but the paper must be porous and not glossy or coated. Encaustic works with almost anything but acrylic or plastics. 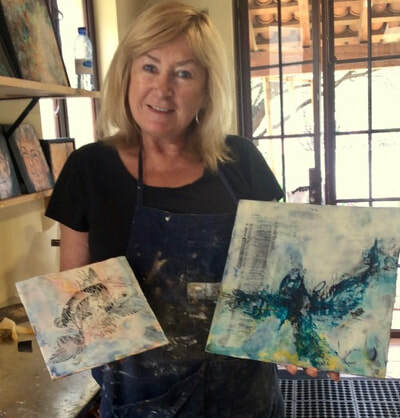 Experiment with all the materials and create your own finished encaustic paintings in class. 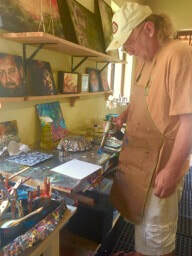 The workshops are held in my home studio from 10 a.m. to 3 p.m. each day. This allows the participants hundreds of examples of my encaustic painting over the last 14 years, including "what not to do!" Cancellations 2 weeks before workshop will receive a full refund. 1 week before, 30% will be refunded. No deposit refunds after that. 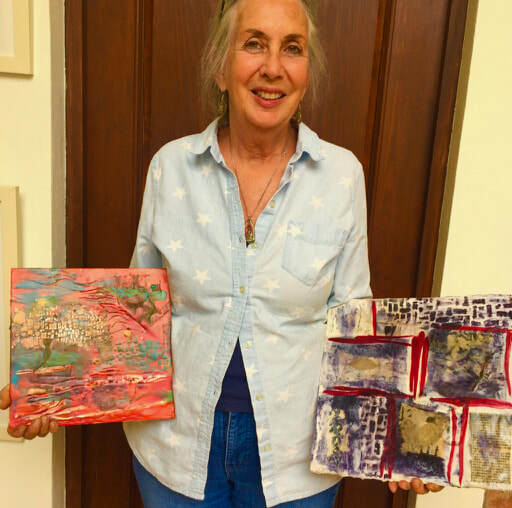 Thank you again for a wonderful class and for introducing me to encaustic painting. I very much enjoyed the experience and your kind, instructive energy made it possible for me to learn much in only two days! You changed my life. I didn’t know that I could be creative. Last night I was quite relaxed -- tonight I could fly to the moon. Wish you were all here for a glass of bubbly. We had such a wonderful day. Ezshwan, you are a very special Woman. Thank you for sharing of your knowledge so freely and giving so much encouragement. 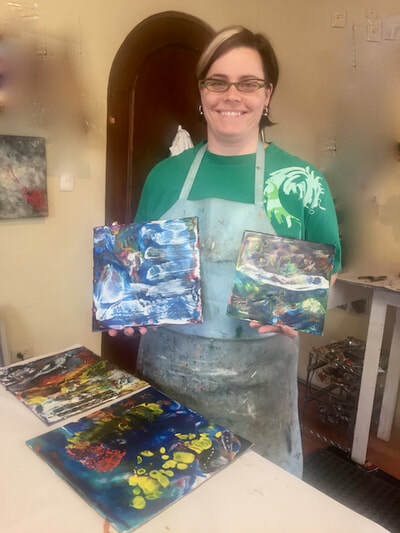 IT is fun fun and the results even for a beginner are super.... try it... what could be more fun than painting with bee's wax and a blow torch!!! Ezshwan, I took your class and loved it. Thank you. It’s not something I have been able to continue with. 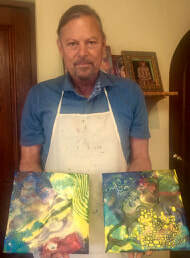 However I was visiting with a gallery and they suggested to paint in encaustic and they would be interested. So, you never know. Maybe the next time I visit SMA. Again thank you. Thanks for giving such a great workshop! 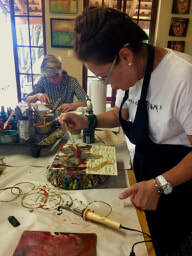 I really enjoyed it;the creativity is endless with encaustic!!! I did in your class, is now showing with my other pieces at RaLuz Gallelry at. S.F. Pasada hotel. I so enjoyed that class, and can hardly wait to get a hold of a torch again. I really, truly, wonderfully enjoyed working with you last time. A whole new world is opened up to me in terms of potential surface decoration for my ceramic sculpture. I want to continue with it. Thanks so much for the wonderful workshop. I enjoyed every minute of it. I hope I will be able to join you next year. Muchas Gracias! Until we meet again may you be safe & well.